Our daughter Maria was born after a pregnancy of 26 weeks and 1 day. She came home totally tube fed. She had lost her seek reflex. She could not drink from a bottle or eat with a spoon. When we tried to practice, she started to retch and vomit. In the end, we had to feed her almost around the clock because she vomited around 6 times a day and she could only handle 30mls of milk in an hour. The therapist told us it could take 2 years before she would eat or drink by herself. We were not happy with that because of the vomiting and it difficulty of placing a new tube. She frequently removed it and cried for a long time when they had to put the tube back. Our friend told us about NoTube and advised us to go to a play picnic. We went there and after seeing Maria they told us that it was possible to help us. They advised us to start as soon as possible, because Maria was a young baby, corrected 6 months, and how the younger they are, the faster they can learn to eat/drink. We decided to start on January 2nd, 2016. I was really nervous to start and I was also scared about Maria’s age, she was so young. But, we really wanted to help Maria to eat/drink by herself and to stop vomiting and we wanted to stop the sadness of having to place new tubes. So, we started Netcoaching with NoTube on January 2nd and from that day everything went fast. We reduced the tube feeding and we prepared a playpicnic for Maria, we also began to offer her food/drinks. The first week, Maria did not eat or drink anything. She did not know how to stop the hunger and still vomited when she felt anything that had to do with food or drinks in her mouth. After one week, she started to play with an empty spoon and once she grabbed my spoon when I was eating chocolate pudding. I will never forget that moment, she loved the taste and she started to feed herself. One day later, she grabbed my cup of coffee and she wanted to drink. On January 12th, Maria took her tube out by herself and we didn’t have to put the tube back. From that day on, Maria was tube free! It was 10 days after we started the wean. We are so happy that Maria could stay at home and she didn’t have to go to the hospital again (she was already long in hospital after her preterm birth). The NoTube staff sent us a message every day and when I felt stressed about the new situation, they sent me an extra message. In the beginning, we had a lot of contact. Later, the contact was slowly reduced. We are satisfied and confident, especially when we see our eating Maria. Yes, life is much easier without a tube. Maria stopped vomiting and she eats like she was never tube fed. Now, 8 months later, Maria eats almost everything, meat, vegetables, bread, fruit. We are very thankful. That she was crying for meat (for the dutch parents: Frikandel). And every day when I see her eating happily, I feel very blessed. Our little one loves food and she is doing very well! 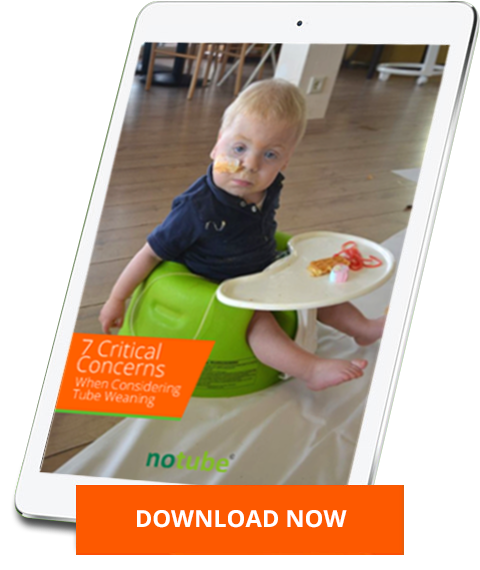 Transitioning from tube to oral feeding is an immense challenge for both parents and their child. What if my child can’t swallow liquid? What if my child loses weight? Will my child need enteral support after the transition?